With the renovation of the main floor came the addition of an Espresso Book Machine, which was given the name “Opus” by the staff at Politics & Prose. Not only can customers self-publish their own manuscripts, but they can use it to print out-of-print books, and in-print books made available by the publisher. But what caught my eye at the store was the line of vibrant new takes on covers of classics lined up along the windowsill. “Recovering the Classics” offers customers a countless number of re-imagined covers to choose from when they print one of the included classics using Opus. The purchase of two “Recovering the Classics” books gets the customer a postcard pack of their title for $4 and a free ebook. 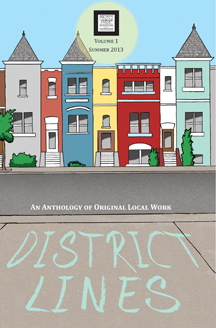 Politics & Prose also published their first anthology, titled District Lines,using Opus. This collection features original and previously unpublished poetry, prose, art, and photographs by local writers and artists. For both volumes, the team at Politics & Prose issued a call for submissions on their website. With their first volume, they were surprised at the overwhelmingly response and received over 100 submissions. District Lines, Volume Two is coming out this coming summer. To learn more about “Recovering the Classics” and the titles offered through this program, go to http://recoveringtheclassics.com/.